Official synopsis: "Magic is dangerous - but love is more dangerous still... When sixteen-year-old Tessa Gray arrives in England during the reign of Queen Victoria, something terrifying is waiting for her in London's Downworld, where vampires, warlocks and other supernatural folk stalk the gaslit streets. 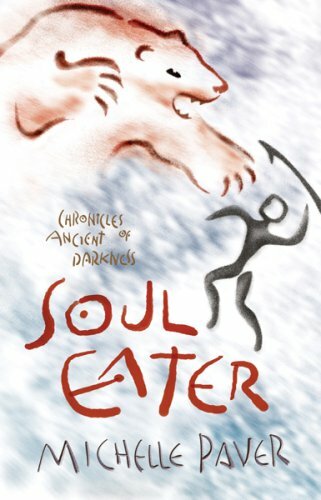 Friendless and hunted, Tessa seeks refuge with the Shadowhunters, a band of warriors dedicated to ridding the world of demons. Drawn ever deeper into their world, she finds herself fascinated by - and torn between - two best friends, and quickly realizes that love may be the most dangerous magic of all." Clockwork Angel is the first book in The Infernal Devices trilogy by Cassandra Clare, which will serve as a prequel series to her award winning series, The Mortal Instruments. And it's the first thing written by Clare that I have read. And I have to say that it didn't disappoint at all! The writing is absolutely fantastic. It's so smooth and fluid, it didn't even feel like reading. If anything, it felt like I was watching a movie! Such skill! 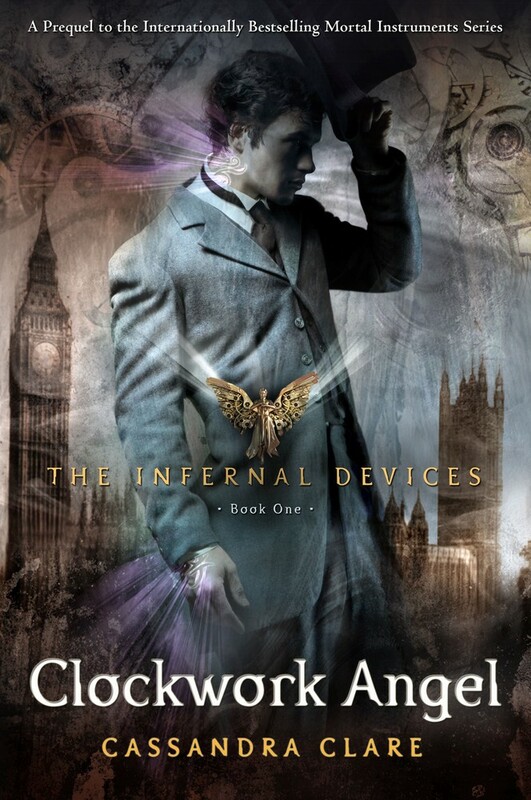 The plot is fantastic and as it's my first exposure to Clare's world of Shadowhunters, vampires and evil, it made a great impression on me. The setting is fantastic. I love the use of Victorian London. It just feels perfect. The dingy streets, the descriptions, it's just perfect. I also like the time aspect of the story. I like that Tessa was horrified when Charlotte is wearing trousers (as any self respecting Victorian lady would be!) and when Sophie, a servant, talks back to Will. Both situations actually made me laugh. To begin with, I wasn't very keen on Tessa. I liked the opening, I thought it was very engaging and it made you question why it was happening, it made you want to read on, but I wasn't instantly drawn to the character. 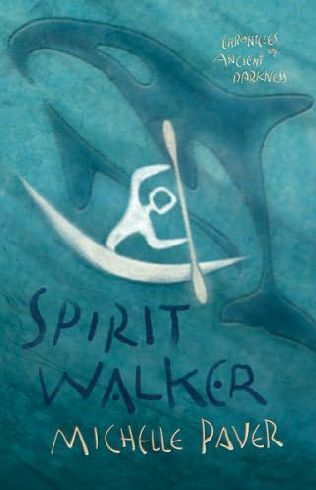 But as the book progressed, I really started to like her as she came out of her shell more. There's definitely a lot of promise for the character she's going to develop into and I cannot wait to see that happen over the next 2 books. The clockwork soldiers actually creeped me out. They were seriously scary. The idea of them - every time they popped up they reminded me of the Clockwork Droids from an episode of Doctor Who. Their mechanical ruthlessness. This book would of gotten a 5 out of 5, but I found the earlier part of the book pretty slow going, and it took a little while for me to actually get into it. But once it picks up, it's a sprint till the very end. The ending of this book was fantastic and has definitely left me eager to read the next book in the trilogy, Clockwork Prince, out late next year! 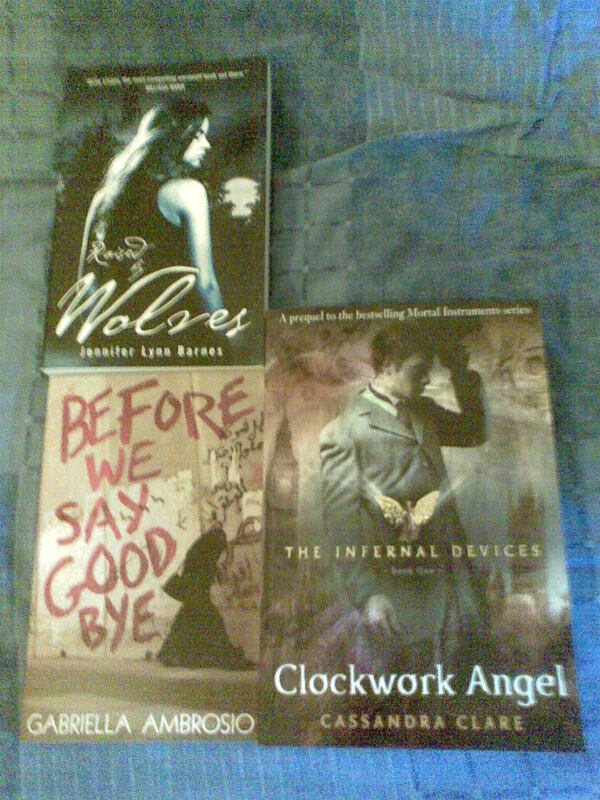 I shall also be getting copies of the 3 published Mortal Instruments books so far and devour them! Make sure you get this book. It's brilliant! My thanks to Sean at Walker for my copy! Published by: Simon And Schuster Children's Books. This book looks incredible. And it sounds it too! You only have to look at the cover to see that it is beautifully illustrated. And it features some very cool new technology! Go to www.wondla.com to find out more about augmented reality, where you can hold certain pages up to your webcam and watch scenes and images from the book unfold before your very eyes on your computer screen! How cool does that sound?! Cannot wait to check it out for myself! Just a little while ago, Maggie Stiefvater revealed the US cover art for Forever, the third and final book in The Wolves of Mercy Falls trilogy. I really enjoyed the first 2 books, Shiver and Linger (reviews here and here) so am looking forward to this, and seeing what our cover looks for. The UK has black and white covers so looking forward to seeing that variation of it. 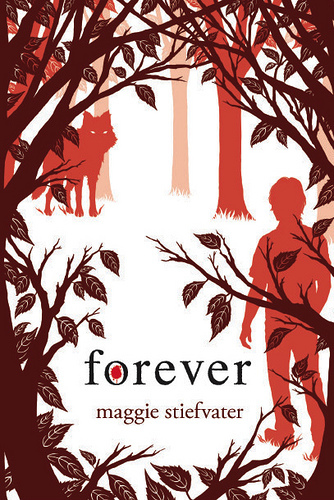 But for now, you can see the US cover below in all it's red glory! It's published July 2011! Hi guys! So I've decided to have a Cover of the Week feature! Which is pretty self-explanatory. My favourite covers, featuring for a whole week. Simple. And this week, we have a real beauty kickstarting it off! 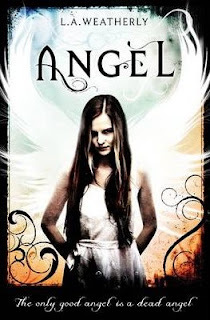 Angel by L.A. Weatherly! It's out this Friday and I wanted to highlight this beaut of a cover! I really like the colours used, and the girl looks very very creepy! And I really like the font they use for the title. Very cool! This book is amazing! There. I've said it. Entangled is amazing. When it first came through my postbox I was a bit sceptical. I am not the biggest fan of pink, and seeing so much pink was shocking! But they always say "never judge a book by it's cover" so it didn't affect my reading experience. And boy what an experience! This book is more twisty than any book I think I have ever read. So many times, when little tidbits were revealed, I'd make a guess, connect the dots, and then something else would happen and I'd change my guess. And then again. And again. And by about the fifth time I decided to give up guessing. But I have to say, I didn't guess the ending. Not at all. This book kept me guessing right until the very end. It is very clever and perfectly written. It's so engaging. Right from the first page I was drawn in. It was annoying whenever I had to put the book down as I just wanted to read on! Why was this girl locked in a room? Why has she been given a seemingly endless supply of pens and paper? Who is Ethan and what does he really want? Grace's voice is perfect. Absolutely perfect. Some books, when narrated by one person, in first person, the narration is a bit sketchy, not always consistent. But in Entangled it is perfectly clear that Grace is on every single page. The perfect voice of a teenage girl. I know Cat herself was a teenage girl at some point, but to get it into written word cannot of been all that easy. So this is testament to what an amazing writer she is. (Yes Cat, you're amazing!). I wasn't that much of a fan of Grace in the beginning however. She was loud, and brash and to start off with, she kind of annoyed me. Every time something good was happening, she spoilt it. But as I read on, I really started to empathise with her, and began to connect with her, to understand her. I understood that her behaviour and attitude has a hidden reason, and that underneath she's just as vulnerable and worrisome as the rest of us. I like that the cast for this book is pretty small. It allows us to focus on them all the more rather than have to keep remembering who this person is, what that person did and why this person is where they are. There are 7 characters in total but only 3 main ones. Nat. Sal, and of course, Grace. One thing that I really liked about this book is that it showcases just how much your opinions on someone can change with the slightest event. Entangled is certainly thought provoking and made me think a lot about how I view my family and friends. 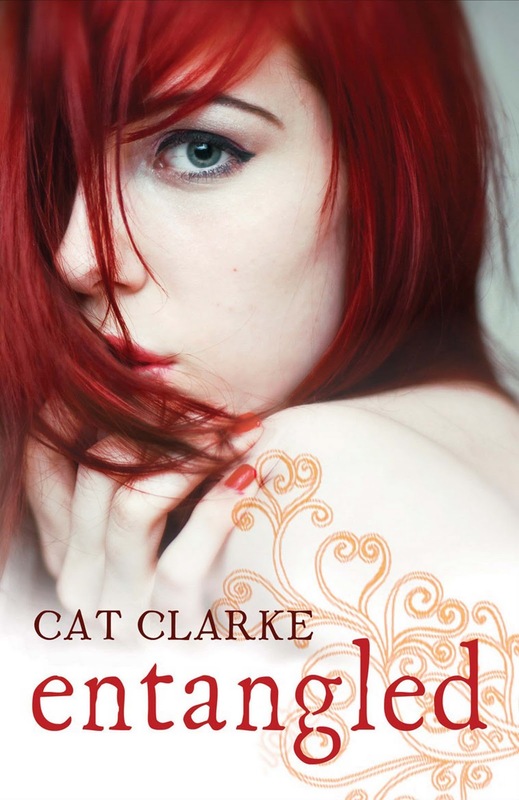 I cannot stress enough just how much I love this book, and Cat for writing it. It actually touched me. I really don't know what more to say, other than do not miss this. Please! It's just too brilliant to miss! It's out on 6th January (2011) so put that date in your diaries, pre-order it, save Christmas money. Whatever you have to do to get this book. Do it! You will not regret it! 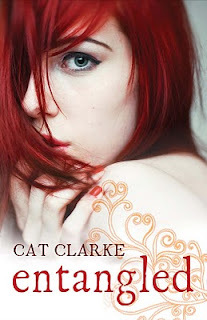 A stunning debut that is beautifully and lovingly crafted! 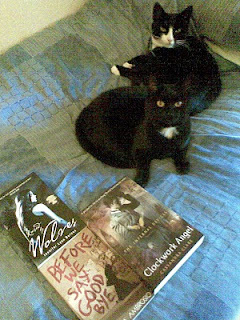 I cannot wait to see what Cat writes next! Thanks to Parul at Quercus for my copy! NEWS: Harry Potter and the Deathly Hallows Part 1 Trailer! The theatrical trailer for Harry Potter and the Deathly Hallows Part 1 has been released! And it's as amazing as the trailer released a few months ago for both Part 1 and 2. Check it out below in it's full glory! I cannot wait to see this film! To celebrate the release of Angel by L.A Weatherly (published 1st October), Usborne have organised The Angel UK Blog Tour! Running from 24th September till 8 October, it'll be stopping off here at Empire of Books on Wednesday 6th October! Where there will be an exclusive to die for! Exclusive videos and never before seen photos of L.A. Weatherly's US roadtrip earlier this year! 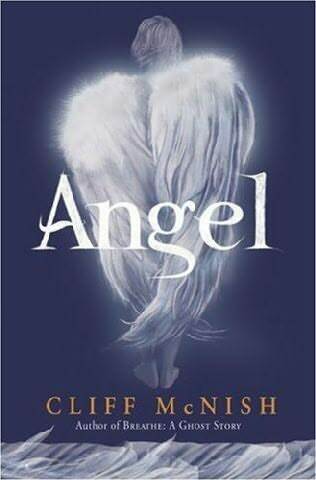 It'll also be stopping of at Bart's Bookshelf, Girls Without a Bookshelf, Bookblabbers and more, with other fantastic exclusives, before concluding on Friday 8th October at Love Reading x where the cover for the second book in the trilogy, Angel Fire will be revealed! 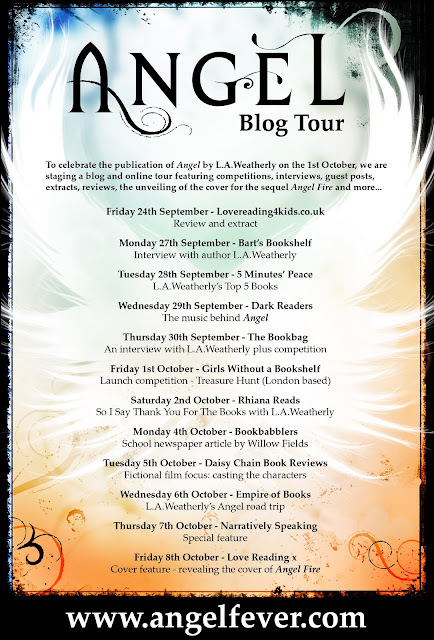 So as you can see, this is a blog tour you do NOT want to miss! This week, seeing as there are a few books I am very excited about, and they're all published by the same publisher, I thought I'd do a Waiting On Wednesday: HaperCollins Highlight! "There's something very wrong with me. I can't remember who I am or how old I am, or even how I got here. All I know is that when I wake up, I could be any one. It is always this way. There's nothing I can keep with me that will stay. It's made me adaptable. I must always re-establish ties. I must tread carefully or give myself away. 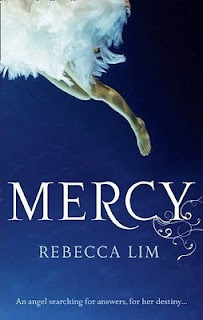 Mercy doesn't realise it yet, but as she journeys into the darkest places of the human soul, she discovers that she is one of the celestial host exiled with fallen angel, Lucifer. Now she must atone for taking his side. To find her own way back to heaven, Mercy must help a series of humans in crisis and keep the unwary from getting caught up in the games that angels play. 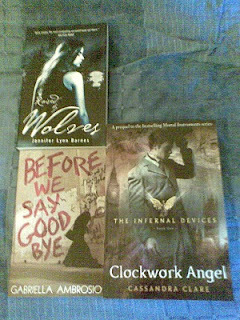 Ultimately she must choose between her immortal companion, Lucifer, and a human boy who risks everything for her love." This sounds brilliant and the cover looks fantastic. Plus I've really gotten into angels lately. Much better than vampires, right?! "In a secret supernatural battle that's been raging for over a century, the stakes have just been raised – and they're not wooden anymore. When Jamie Carpenter's mother is kidnapped by strange creatures, he finds himself dragged into Department 19, the government's most secret agency. Fortunately for Jamie, Department 19 can provide the tools he needs to find his mother, and to kill the vampires who want him dead. But unfortunately for everyone, something much older is stirring, something even Department 19 can't stand up against…"
There actually isn't a cover for this yet, but I saw it on HarperCollins site and it sounds brilliant! Cannot wait to read this one! Released: 28th October 2010 (Re-print). It could be his head wasn't screwed on just right.It could be, perhaps, that his shoes were too tight. 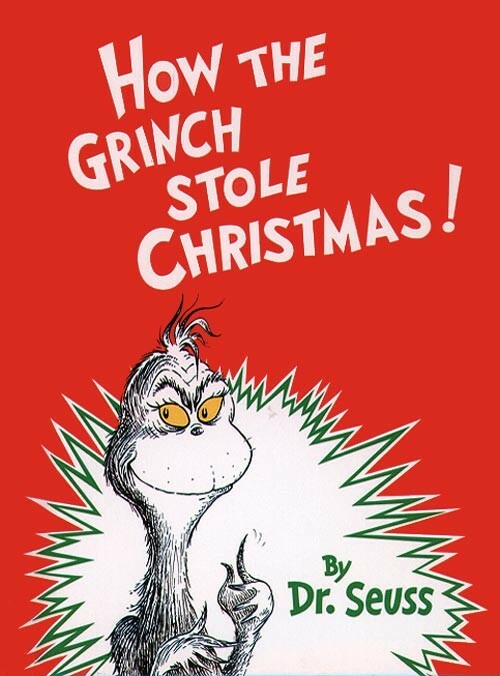 The ghastly Grinch refuses to be moved by the Christmas spirit in this lovely hardback version of Dr Seuss's classic tale. With zany rhymes and distinctive black and red illustrations, this classic seasonal story has become a favourite for good reason. 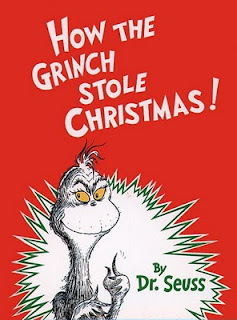 In the end, the story of the ghastly Grinch has something to teach us all about the true meaning of Christmas." So there you go. Some highlights coming over the next few months from HarperCollins. What books are you excited about right now?